In Yosemite, you can walk the world’s first line. 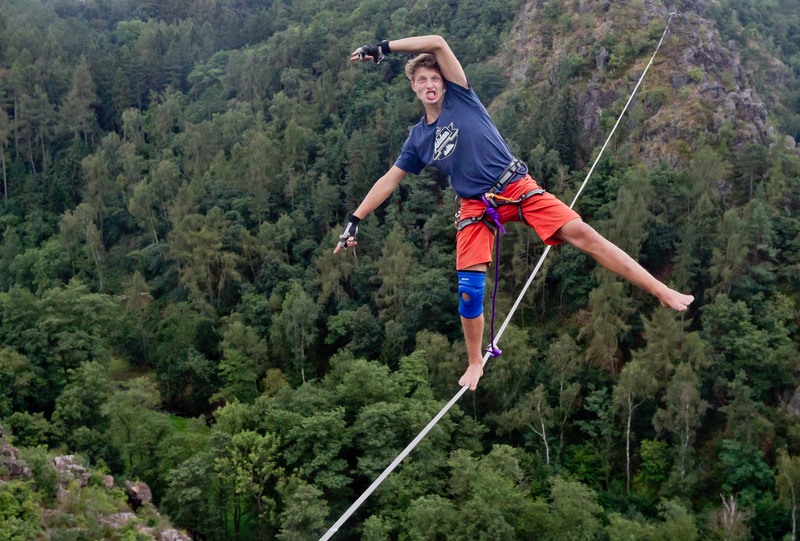 In Norway, you can walk one kilometer above the ground. In the Alps, you can watch the surrounding mountains as if from a plane with your feet on a thin strip of webbing. But if you take your friend from California to Adrspach and they just cannot believe what they see: “That is awesome! It is so epic! 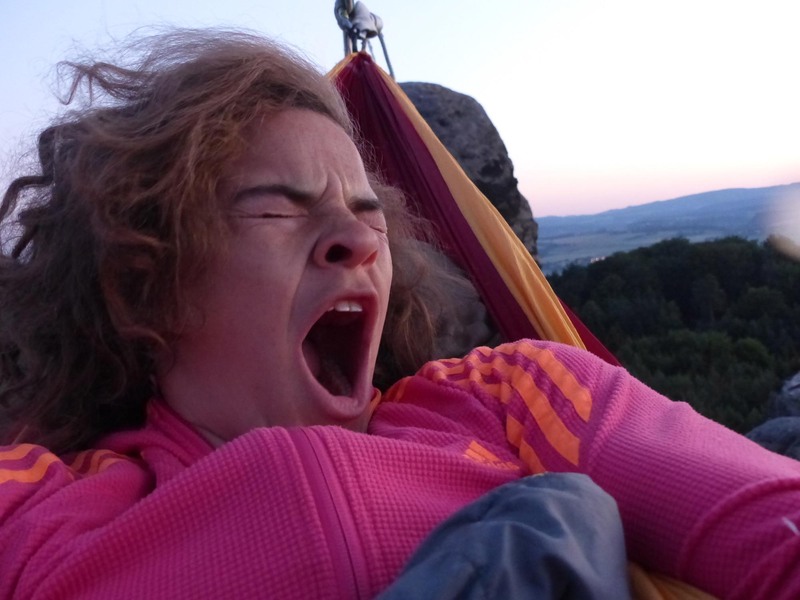 Oh my gosh, that is hilarious!” Or friend from Chamonix comes for a week and gets stuck in the Czech sandbox for a whole two months. We’ve got some beautiful lines! Not only are there plenty of them here, but some of them are true gems. 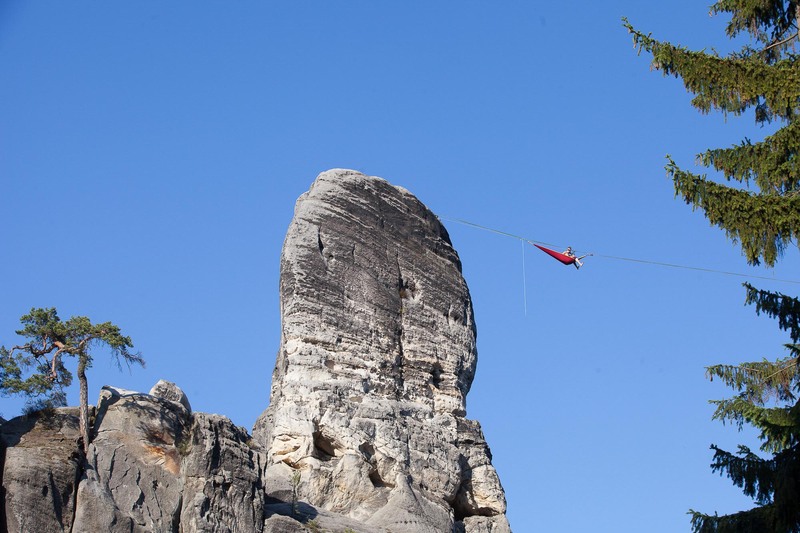 This article will show you the top 10 – EPIC – Czech Highlines (presented in a random order). Shangri La – another word for paradise. 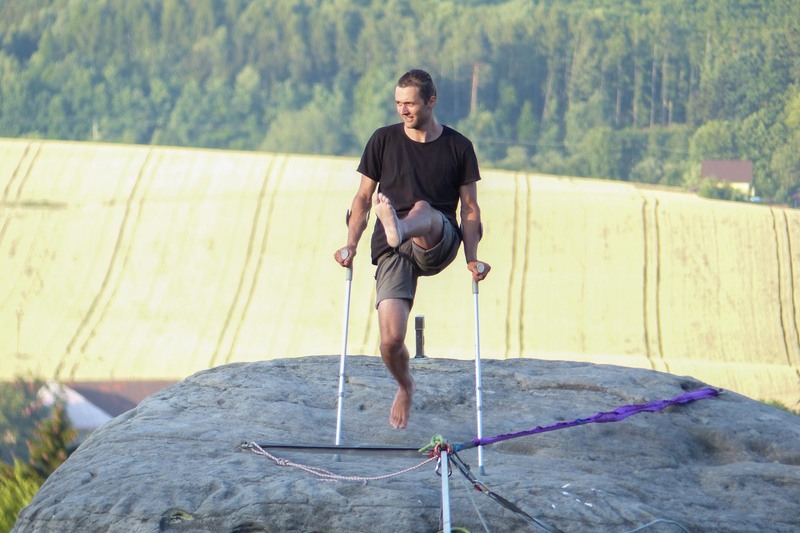 Appropriately named by the American slackliner Faith Dickey. 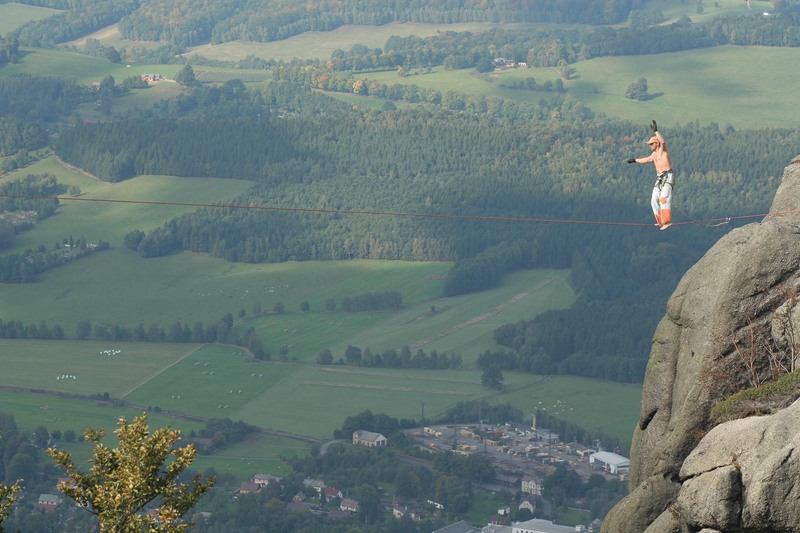 This line is located in the Czech Paradise and you definitely feel like you’re in paradise when you walk it. The line is rigged between the Ocún and Únorová towers. “A beautiful line in a beautiful place. 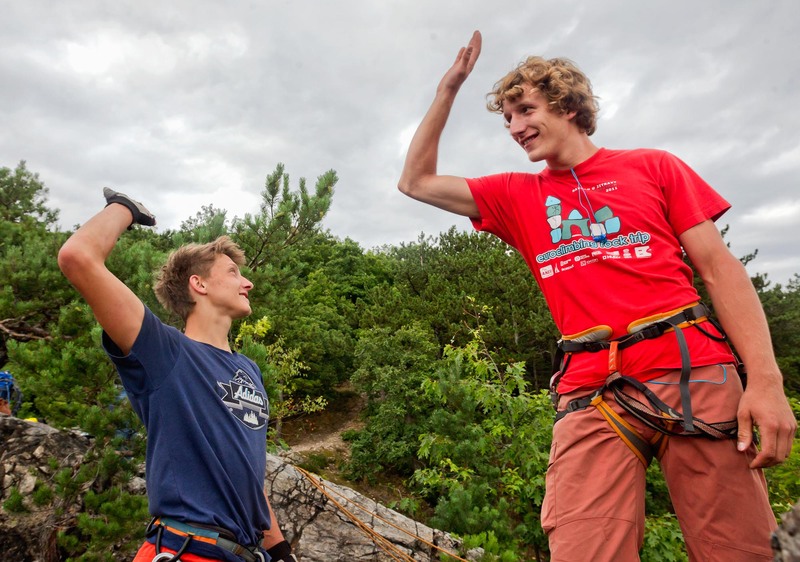 The people who can follow you to the tops of sandstone towers are true friends for life. 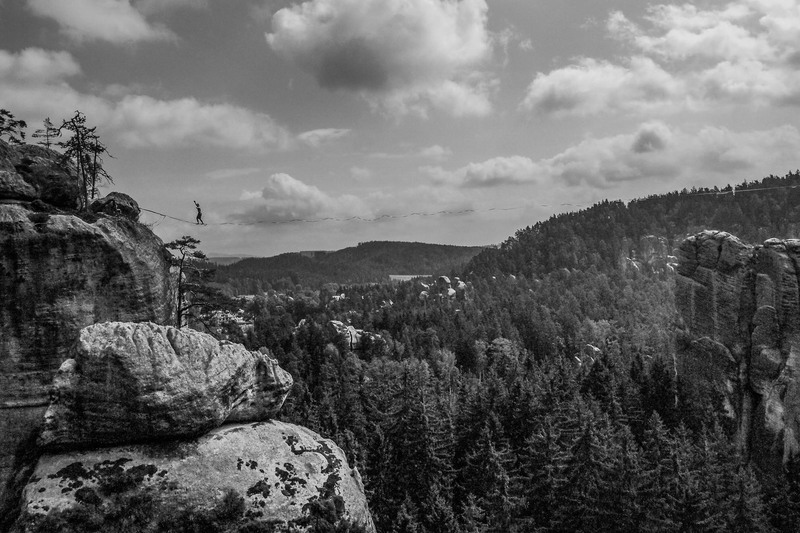 It’s an exposed line with an indescribable atmosphere,” remembers Petr “Peeto” Kučera. One of the first monster highlines in the country. “This is probably the first loose line I managed to walk. We first rigged this line in 2011 with Kwjet, Janek, and Jordan. And now, with a loose backup, I had to fight the same way as six years ago. I still find loose lines to be unnecessarily hard,” says Faith Dickey. 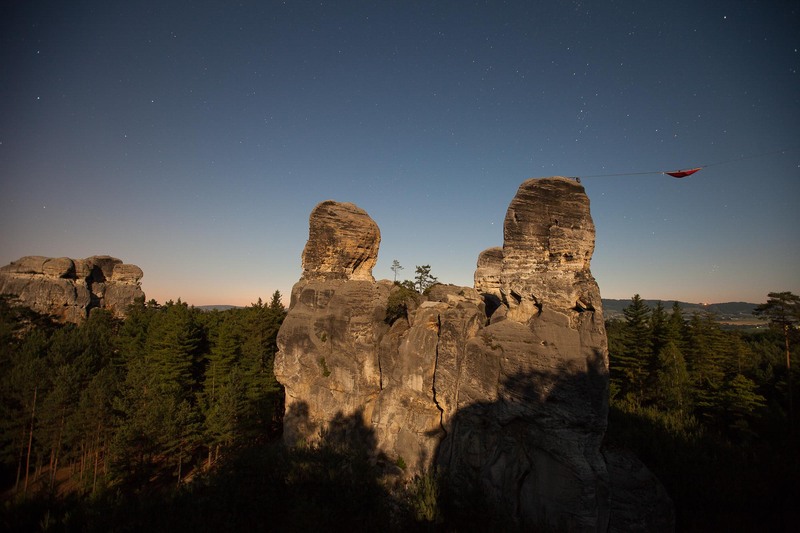 As Jakub „Kwjeták“ Hanuš, who discovered and established the line, remembers: “I saw that gap immediately when I first came to the Himmelreich area to rig some other lines. 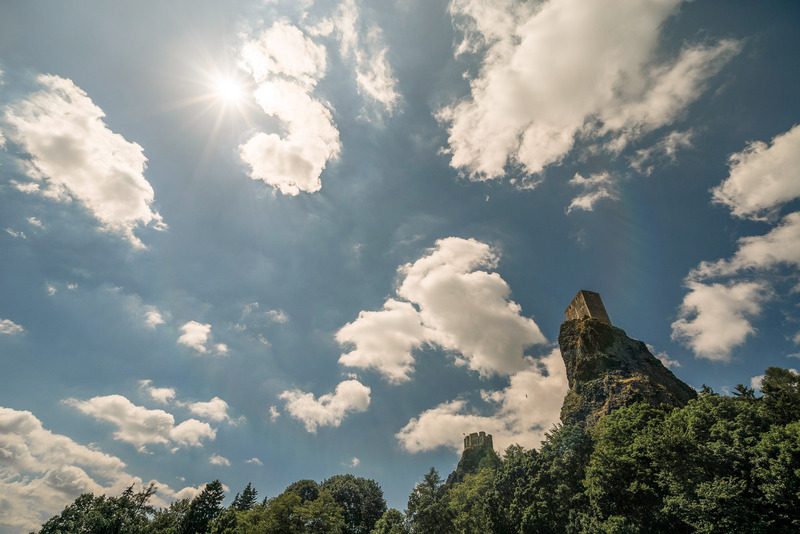 It crosses the small valley between the Velká tovární tower to the tower opposite towards Ostrov. 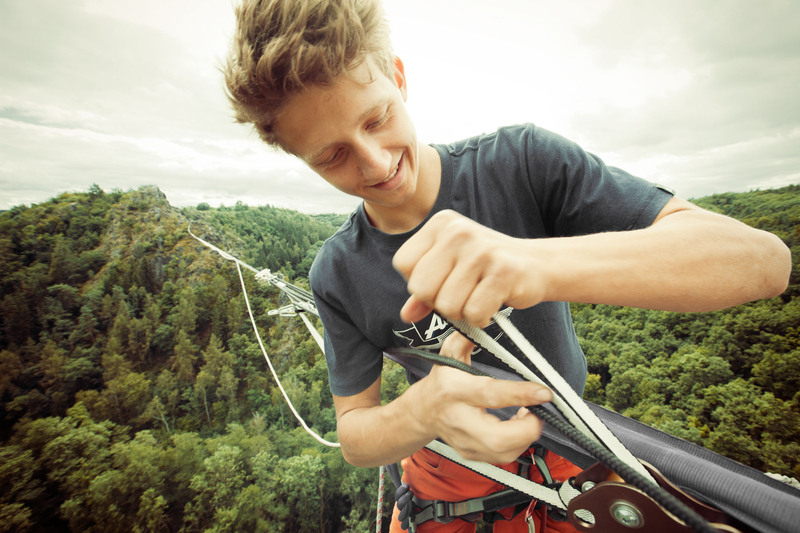 It has amazing exposure and a nice length (65 meters) suitable for anybody who practices highlines at least a bit. Back then, we saw it as a “monsterline”. We rigged it with the Somewhereelse Land team (Janek Galek, Faith Dicky, Jordan Tybon and myself). Together, we put up some of most of the famous lines in Ostrov (Master of the Universe, Island King, and other lines). The name might be a bit of a metaphor. I personally like how the word sounds, but when I think about it, a narco baron is someone who delivers quite strong experiences (simply put – drugs). 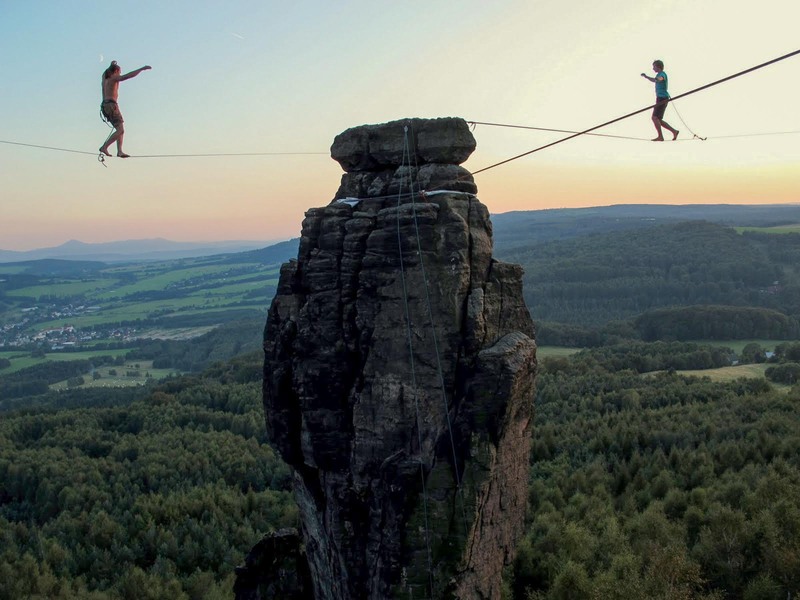 And when you walk a really long highline you get to a state that strongly resembles being high, this one will surely get you! 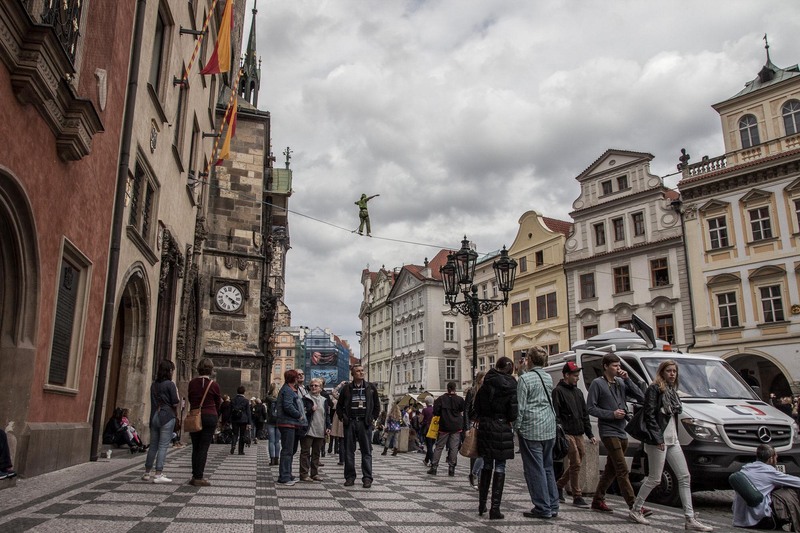 This line is easily accessible with Prague’s tram. But, it has a great story. 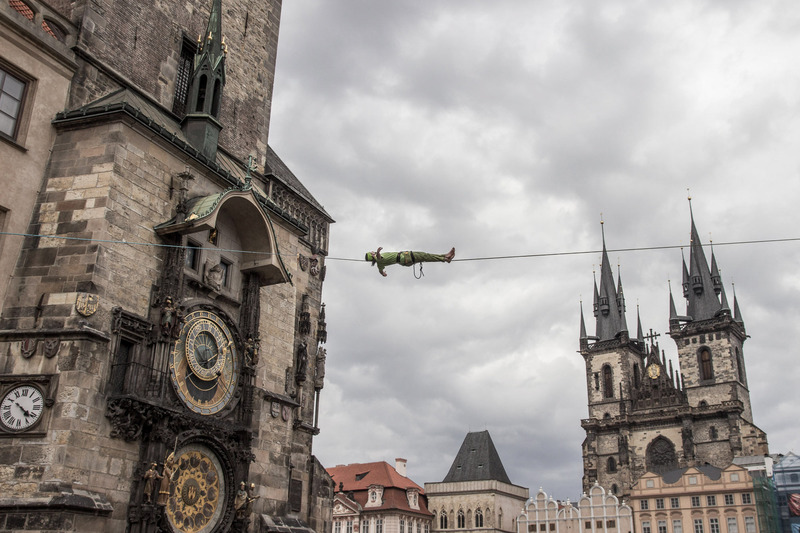 It’s a first Czech line rigged with a drone. 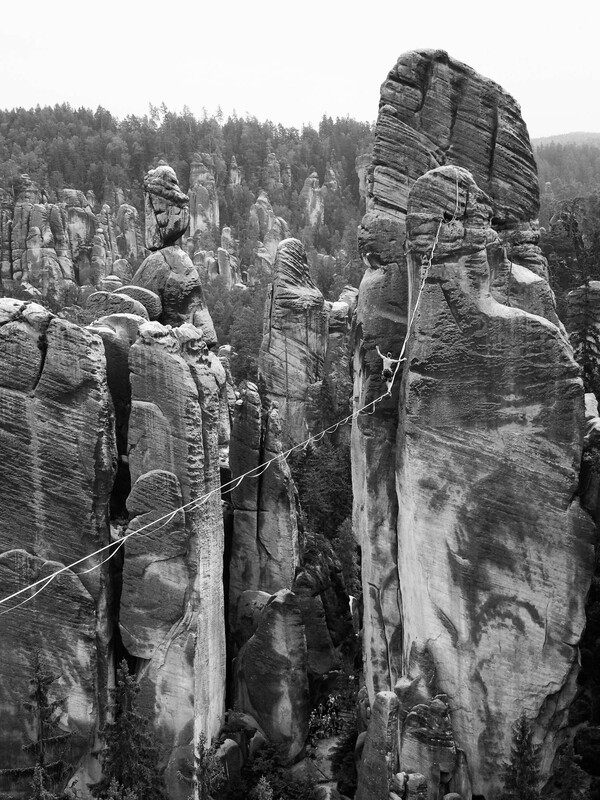 It’s the labor of love of Danny Menšík, who rigged this 208 meter line to cross the whole Šárka valley. The world record was 214 m back then, so it appeared to be a European record. On that same day, however, Danny got the message that Julian Mittermaier from Germany sent 224 m. Danny had tried to rig the line two months earlier, but he was unable to at that time because it was so problematic to link both sides together. The line fell and tangled into the trees. “So we came up with a bold inventive plan that involved using drone that carried a thin light fishing line that was light enough for the drone. Then we used the fishing line to draw a thin rope across the valley and subsequently the line,” remembers Danny. And result? Any details about the negotiation? I had the lease nine months in advance. 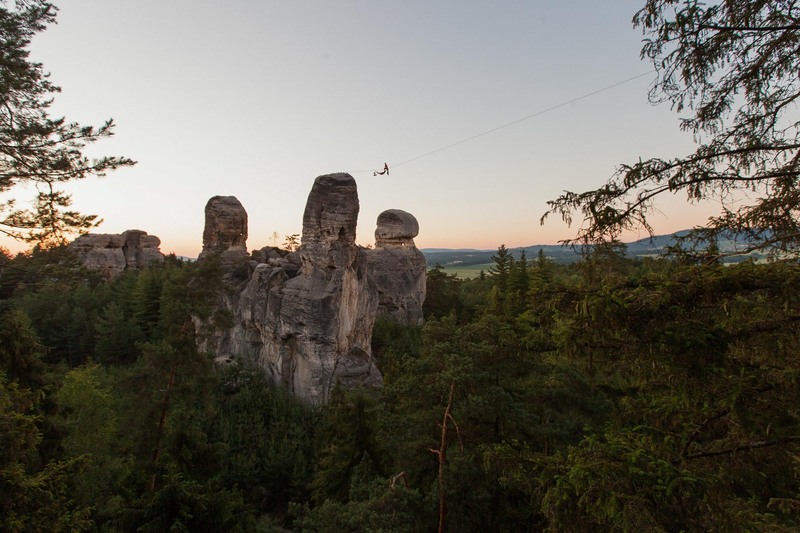 We checked the places that were designed to rig the highlines with the castle keeper Lubomír Martinek. I provided him with all the technical details about rigging and he took the documents to a board meeting, where it finally passed. The important thing was the detailed plan of the rigging. 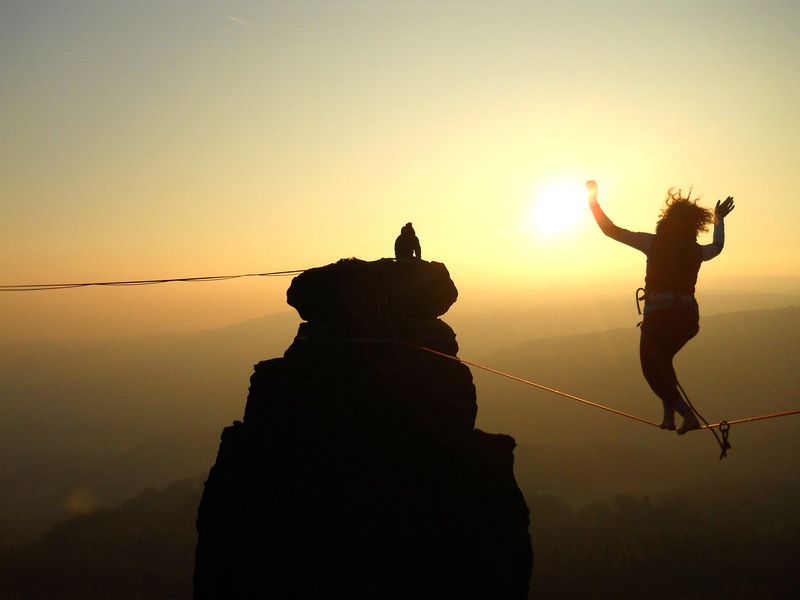 With this plan, I was secured permission to to use the castle for two weekends, the first to test and the second for a highlining event. Next year, we will need to renew the contract. I plan to submit the proposal very soon. Does the contract provide you only with the spots for rigging or with the whole castle? How did you anchor the line? The castle basically consists of 900 year old ruins. I have no idea about what holds these stones together, so our aim was to spread the strength to as many directions as possible and apply only a low tension. On one side, we were able to put the anchoring sling around the whole rock tower but on the other side we had to use the parapet and that was much more complex. Of course, we had to respect the strict ban on drilling or any changes to castle walls or rocks. In this way, we left no trace. Did you enjoy the line? I was probably the only one who couldn’t send it. However, most of the others set new personal records here. I guess they got so hyped by the spectacular setting that it inspired the best in them. My personal goal, though, to organize and host the event, everything went smoothly, so I am pleased even though I didn’t walk the line. I would like to repeat the event every year in the similar way. No drilling, no advertisements. We are thankful that we can walk in this ancient atmosphere. 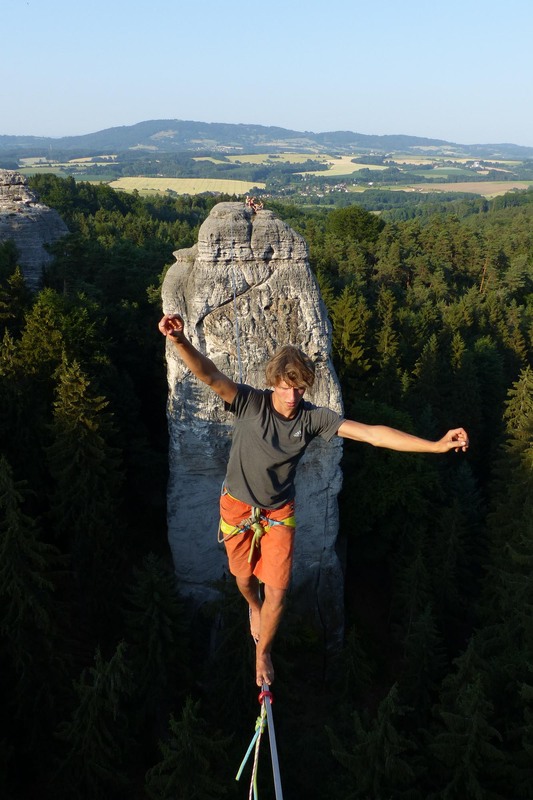 North Czech classic from the early days of slacklining The line from the Doga tower was established by some of the first Czech slackliners, Kolouch and Kajoch. 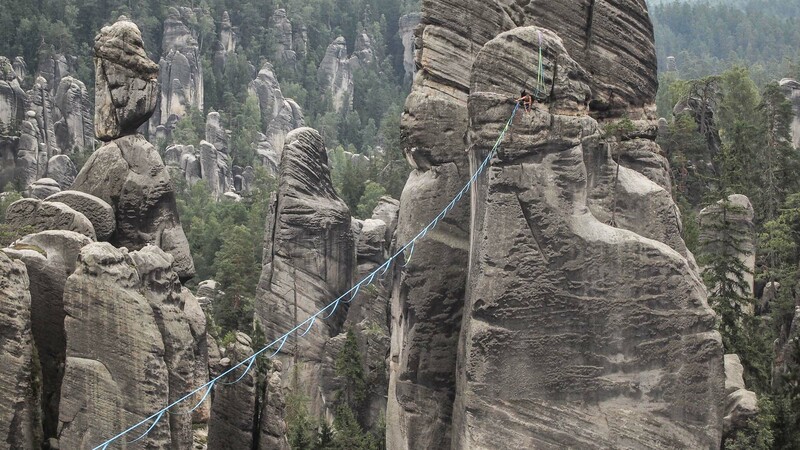 They were among the first ones to walk a 100 m longline. And today? 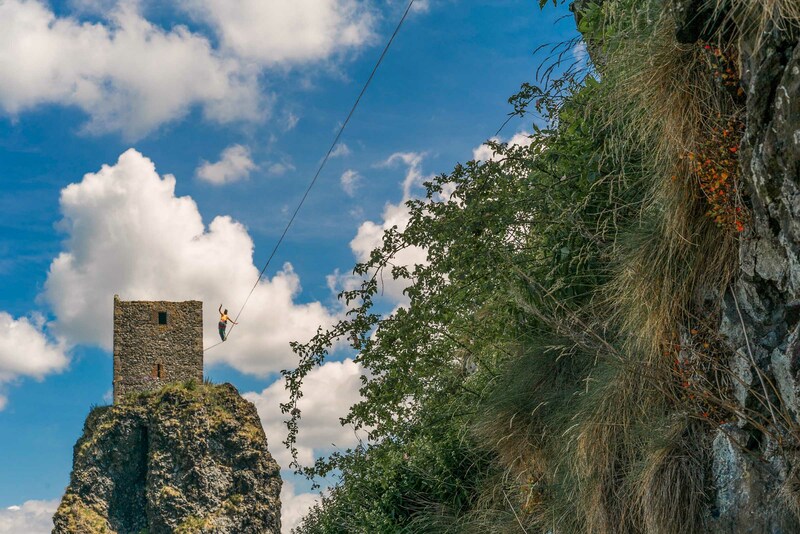 This tower has become so legendary that the slackliners see it almost as a holy place. Last year, Anče and Kwjet even got married there. First, a parson and witnesses climbed the tower. 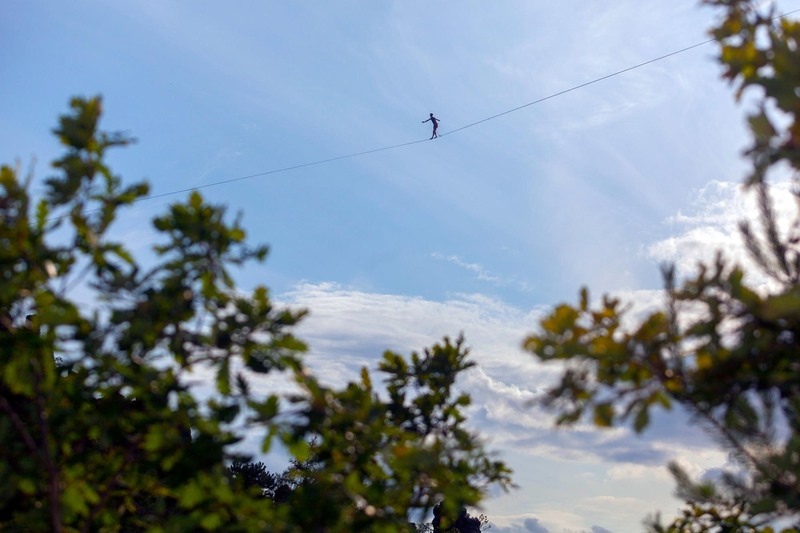 Then the bride and the groom came via the highlines. Bride on the right and groom on the left. We need to mention that there was some controversy about rigging on these exposed towers because look quite unstable. 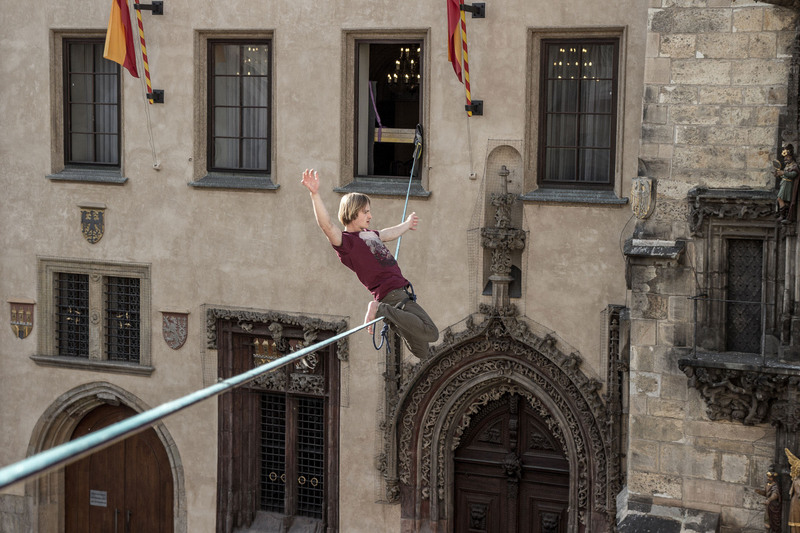 Old-school slackliners say that if Doga survived the large tension, which was usually applied to lines back in the days, it should have no problem with modern “hanged” lines. 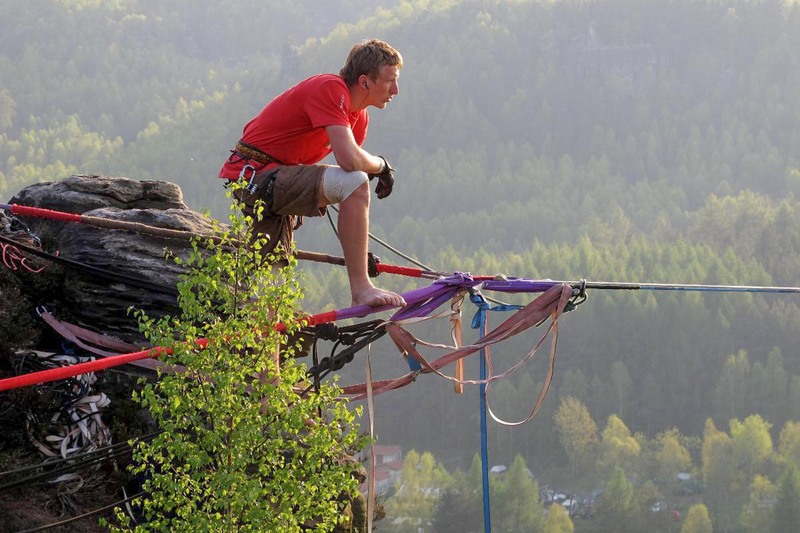 Still, if you decide to rig this line, always be careful and never use the boulders on top of the tower as an anchor. 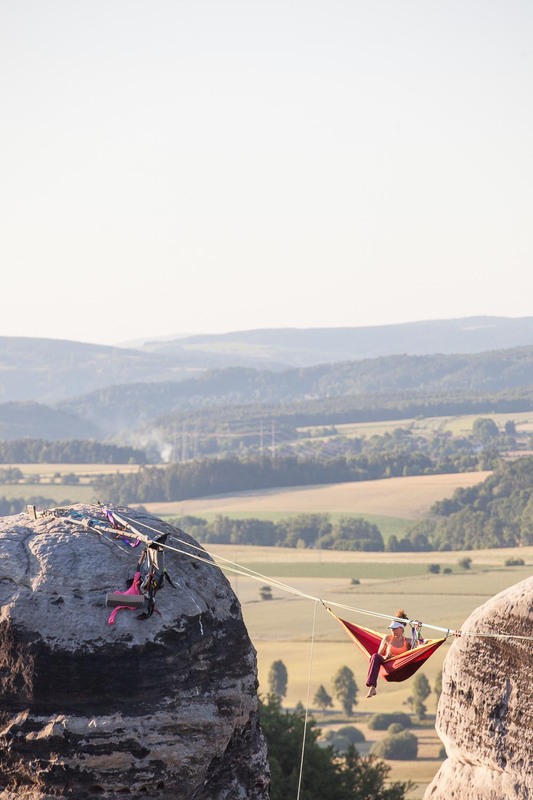 82 meters long, 30 meters high, Plakánek Valley, Czech Paradise. 100 meters long, 60 meters high, Adršpach. Finally something from Adršpach! This glorious line links the Malý Konšel and Kokšova towers in close proximity to the legendary Starosta tower. 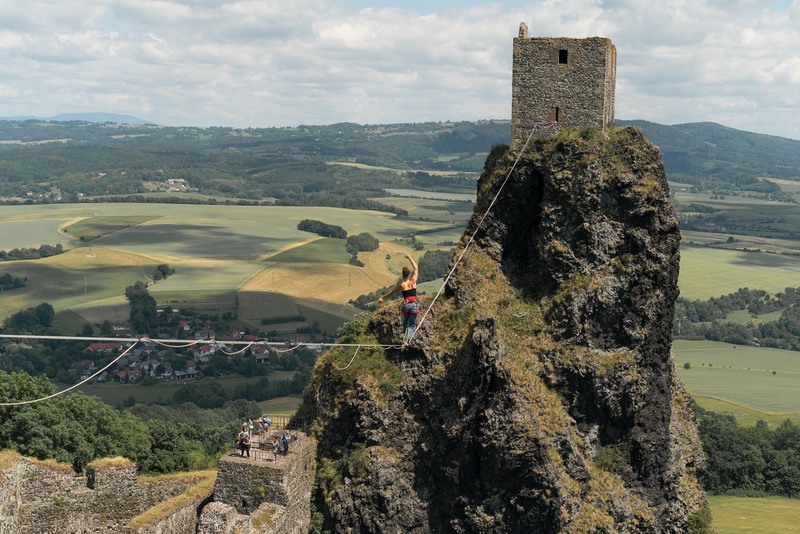 Local expert Honza Halfar will tell you more about it: “Well, the main thing is that it is a great line that links two big towers in Ádr.” It connects two sub-areas, Království and Město. It’s quite high and right above a tourist path. It’s challenging to rig and you can bet that you will become a tourist attraction. What I really like about it is that both of the sides of this line offer a grade three jump. Just by walking and jumping, you can reach four big towers, almost without any climbing (he laughs). This line offers something interesting for everybody. However, you need to dedicate some time to it. You need plenty of slings for anchoring and you will have to climb. There’s a spicy chimney section, but if that’s not enough for you, you can still do the grade three jumps. A remarkable line in the medieval heart of our mother city. “Apoštolka is a very specific highline. It was rigged only once and I’m not sure if it will be ever repeated. We anchored the line on the both sides from the windows. One side from a window in Prague’s old town hall, which is a national heritage site, and the other a window in the most expensive hotel room in central Europe. 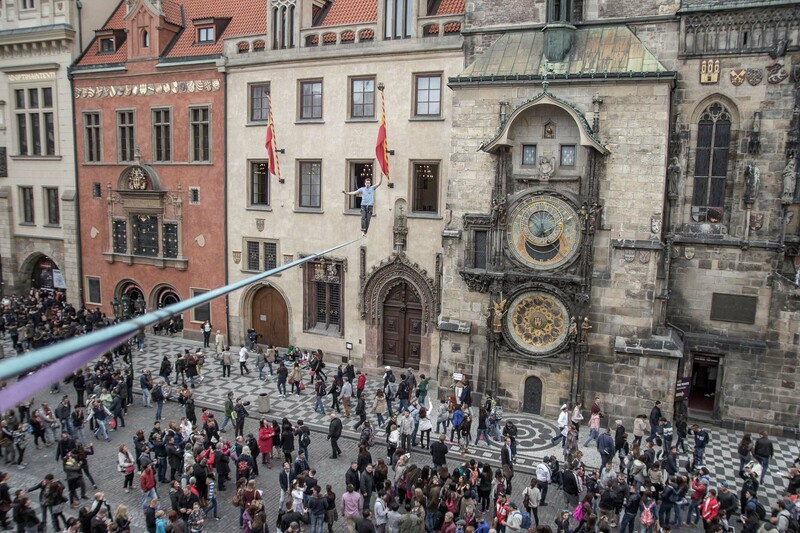 It is the closest possible line to the Prague astronomical clock. We chose this location with Michal Tyl. 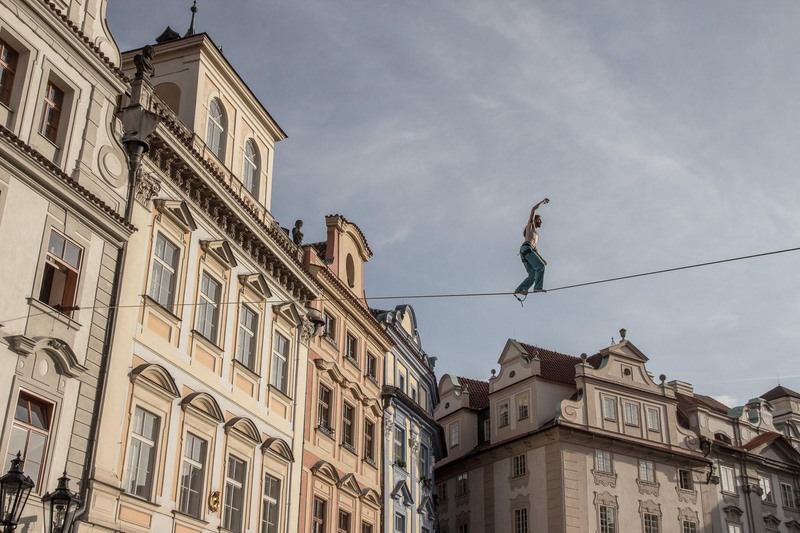 The line was rigged as a part of event Prague in Motion. 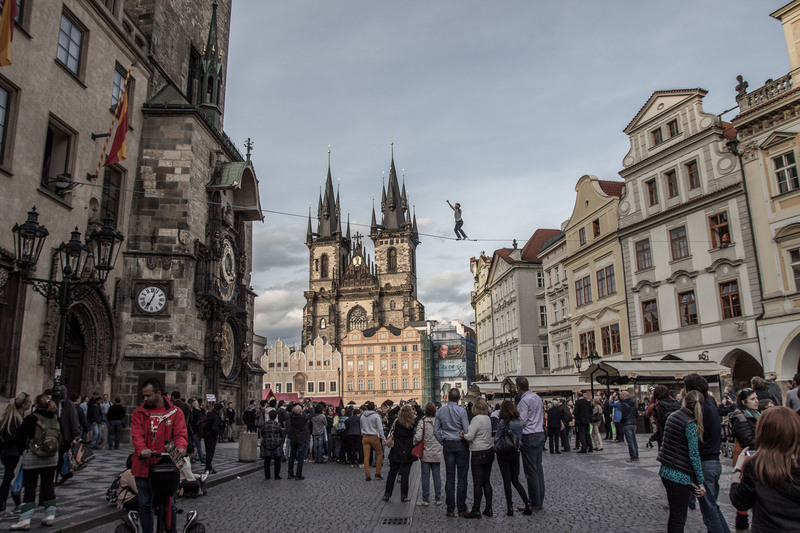 The event was organized by Czech Tourism to support sports in Prague. 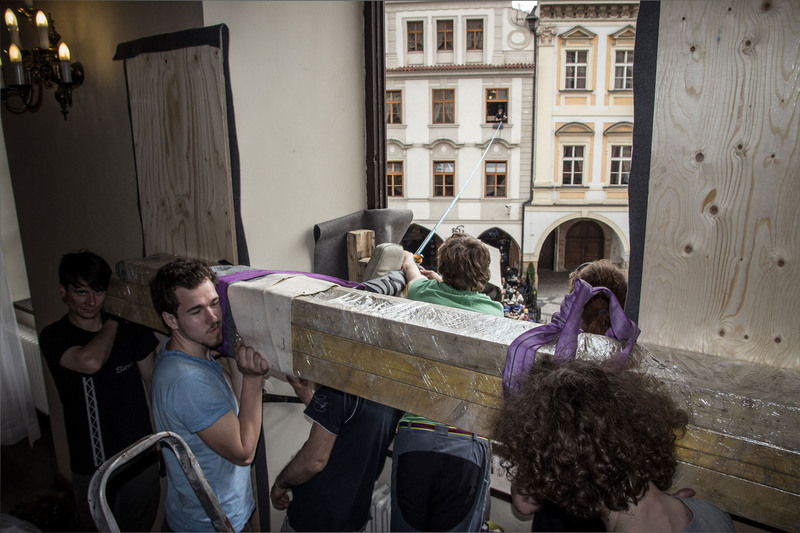 Our original plan was to rig a line between the tip of the town hall tower and the tower of Church of Our Lady before Týn. However, we did not get permit for that one. It wasn’t easy to negotiate permission for Apoštolka either. 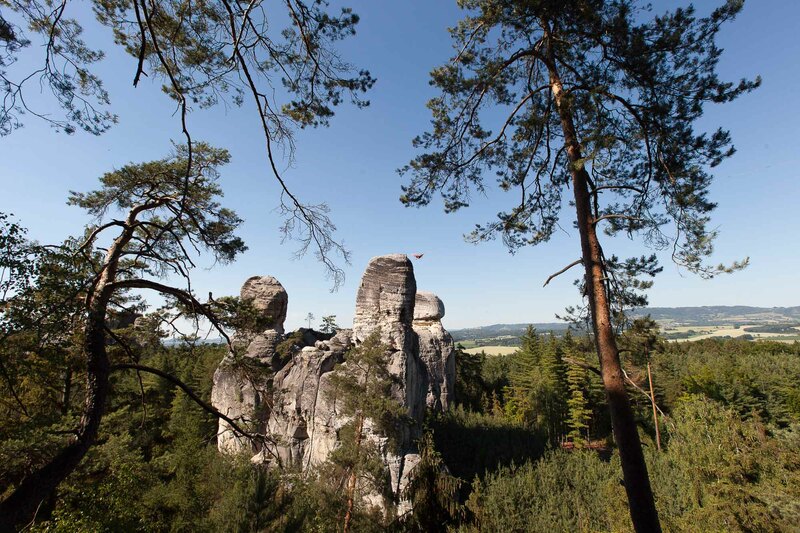 It was only possible thanks to Czech Tourism organization. 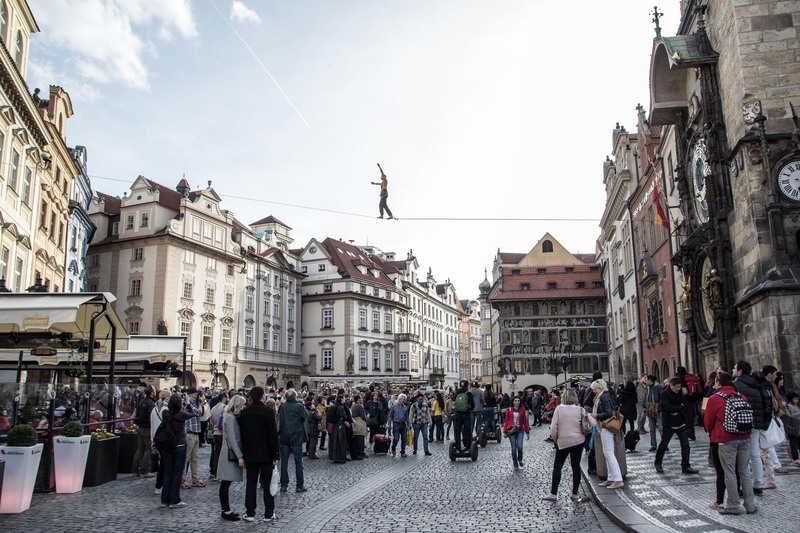 After long negotiations, we finally got a permission to rig the line from the National Heritage Institute, preservationists, and from the city council of Prague. If you have ever dealt with any problems related with monuments and national heritage, you can imagine how complicated it was. We anchored the line using wooden beams. We also had to protect the walls of the building by bandaging the beams in the spots where they were touching the walls. The windows are not exactly aligned so were afraid a bit that it would slide and damage the walls. That would have been really bad. Eventually, it turned out all right and the line was even nice to walk. The historical buildings have a special charm. Walking right towards the astronomical clock was quite an experience. On your side the whole old town square, all the old towers… Under you the never-ending crowd of tourists with cameras. I really enjoyed walking the line. The worst part was the endless interviews with the media, the TV and newspaper people. 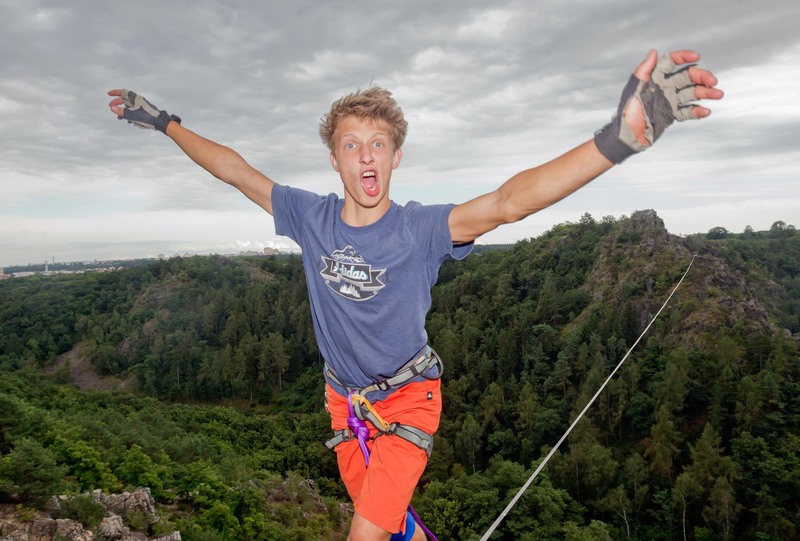 Still, it was a nice opportunity to promote slacklining in our country. That time, Kolouch didn’t even manag to stand up on the line and so he returned to the spot with his friends in next season, in 2008. Kwjet Hanuš remembers how Kolouch fought that time: “He always did a step or two, caught a line, and repeated. When I got to the line I immediately got what’s going on there – the exposure changes it all. I could do just a couple of catches and I was totally exhausted. Even though I knew that it was safe, the height kept disrupting my balance. My vision blurred when I was trying to focus on the rocks on the other side. I definitely wasn’t able to do so many catches as Kolouch, it requires a massive strength. Finally, I let him to do the hard exploring job and just watch him fight for every single meter of the line. People are coming and going, applauding and cheering. But, nobody gets what’s really happening! As Kolouch manages to walk more than half of the line in one go and falls again. It’s clear now that the line won’t resist him too long now. After some rest, Kolouch gets on it again and crushes the whole line this time! YES! He sent it! 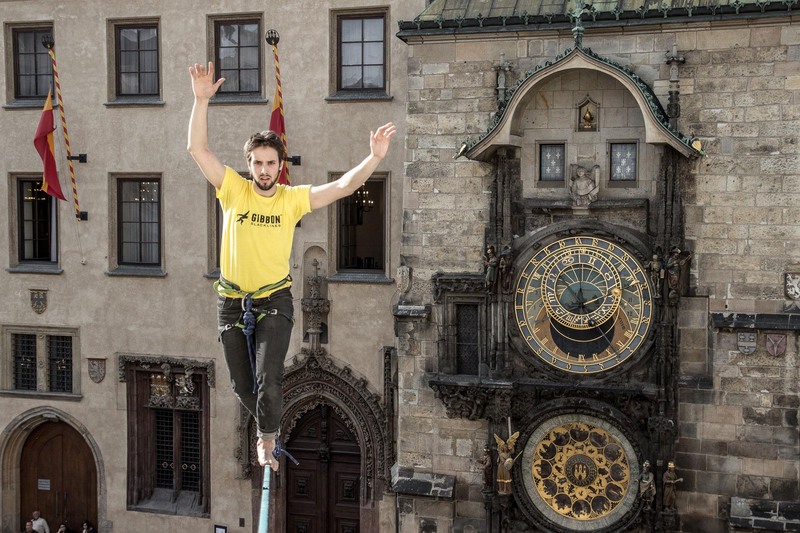 The last year, he did not even manage to stand up on the line and now he became the first Czech to send the line. Before he loses the drive, he manages to walk the line in the opposite direction as well. Huge congrats, Kolouch is done with the line and smiles contently. He cannot wait to put his special fancy earring into his ear. Once I saw that Kolouch send it, I got the feeling that I have to walk it now or never. However, I did not have much power left and I did not want to undergo that cataclysm of sit starting again and again. I tie in again, sit down, shift a few meters into the front. I slowly get up, trying to tame the gentle vibrations of the line. The absolute concentration. Step after step, I become more and more confident that I can do it. I become unstoppable: step after step after step… When I’m past the middle of the line I start enjoying it. I know that I can do it. I safely walk the last meters, catch the line and go back to the solid ground. I’m full of euphoria that I never experienced before. 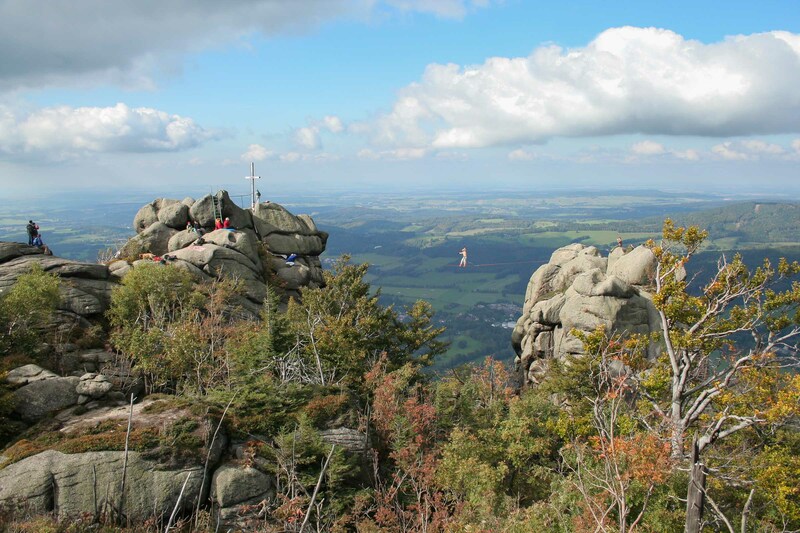 For the next two hours, I sit at the top of the Cimbuří rocks and watch the sunlit landscape, thinking about what I have done. Kolouch tries the line a few more times and manages to send the line in both directions again. 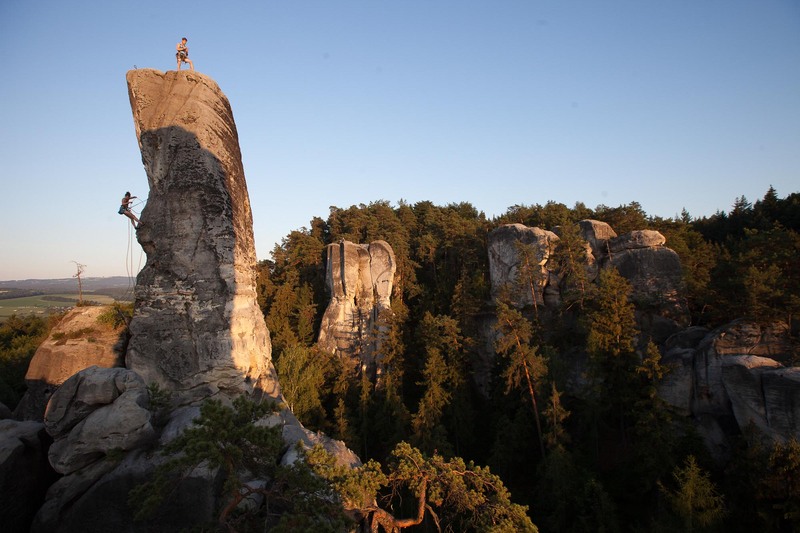 If you’re interested in learning more information about climbing in the sandstone region, feel free to contact us. 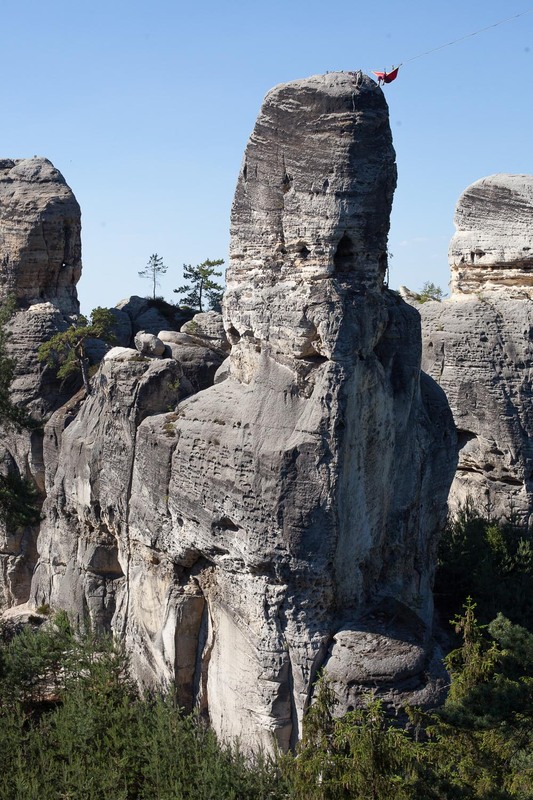 We can tell you which seasons or months are the best, which routes are a must-do, which are not dangerous, where to stay, where to park, where the best beer is tapped, and so on… Our enthusiastic editorial board is based in the north of the Czech Republic – where the sandstones shape the landscape. Write us at: [email protected] . 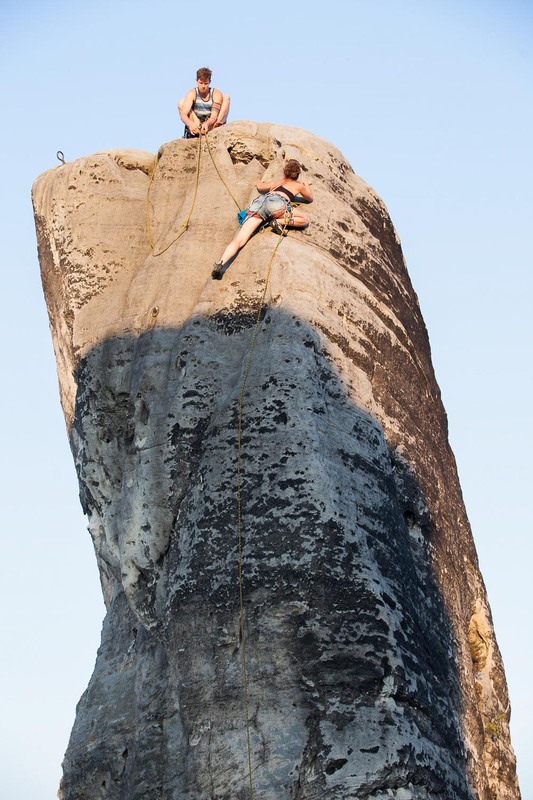 . .
eMontana Facebook | Join us for a new climbing story each month. 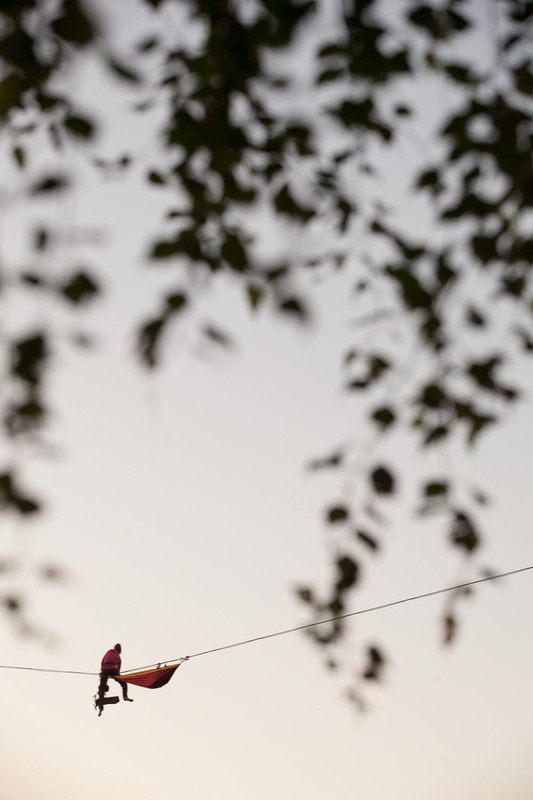 Slackliner and architect. 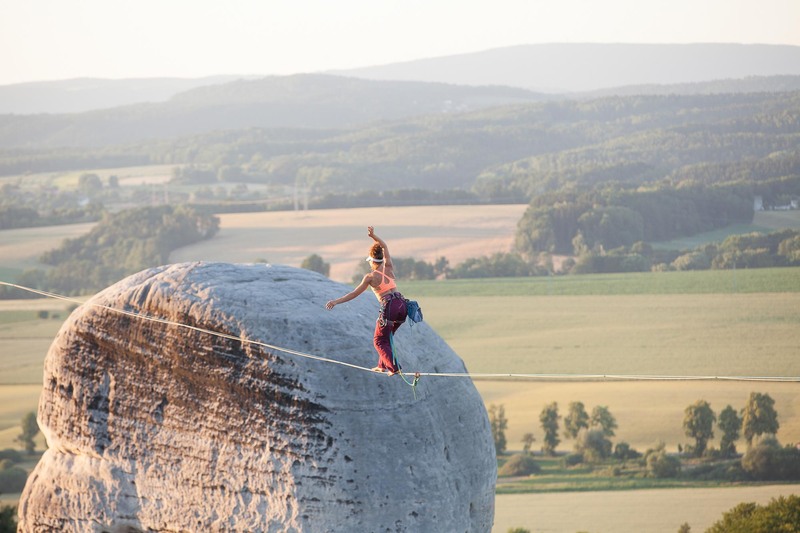 She quited her job for the slackline circus. Youc can meet her in the rocks, in a park on the line or excercising joga. 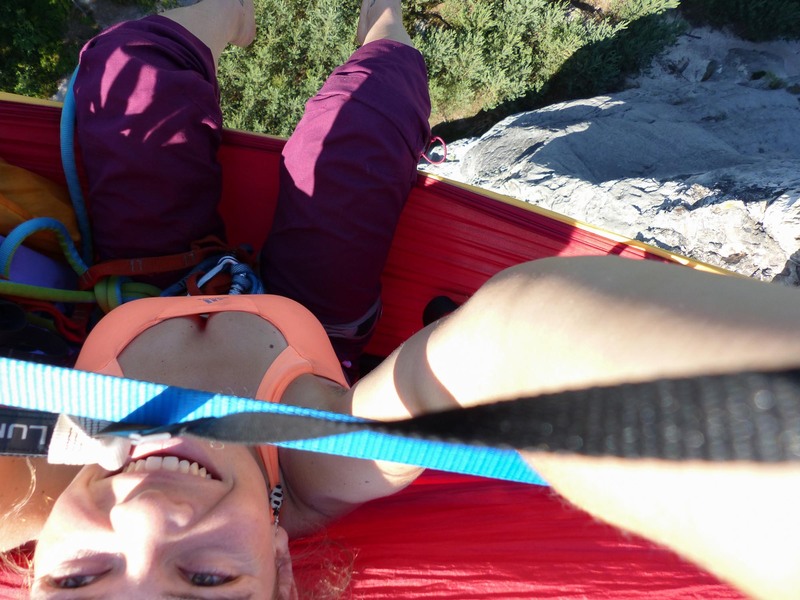 She has founded Slackline Academy, where she learn you everything. He loves to write about inspiring people. 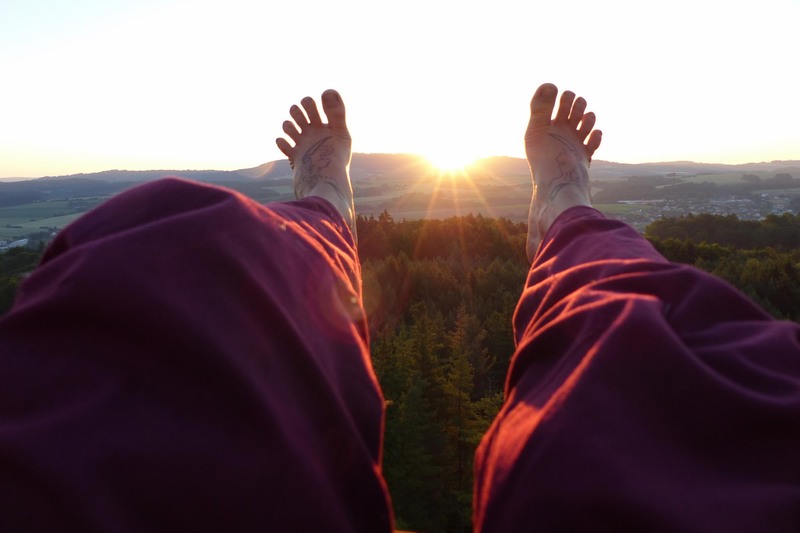 Addicted to situations when he does not care about the time – in the mountains or sandstone crags.